Reed’s Candy is one of the few manufacturers in the world that still molds hard candy from a heated syrup state and individually wrap each piece. 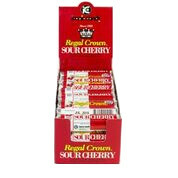 Iconic uses the 133-year-old formula and tradition to make Crown Regal Sour Cherry hard candies. It was portrayed in James Bond like TV commercials. The tagline of the day was “Tart-N-Tangy”. Reviving the Trebor tradition, Iconic candy Rolls out these individually wrapped sour cherry & sour lemon favorites to the delight of yesterdays and today’s candy fans.